17-Oct-2004 -- I heard about the degree confluence project in the summer of 2004. I thought it very interesting and started to select a confluence to visit. It should be, not visited yet, on land, not too easy but possible to visit. I chose the confluence, N 37 E 139 as my goal to visit. I also found that why the confluence had not been visited, because there is no trail around there and if you try to visit there through canyons, they are narrow and deep. Four of us examined three routes to get there. Two routes from north, a route from south. Two routes from north look comparatively short (2 days), but difficult. A route from south looks not so difficult, but long (3days). We wanted make it on the first trial, so we decided to visit from south. 16-Oct-2004 We climbed Mt. Makihata from Shimizu, and walked to Mt. Ushigatake. It was snowing the day before; trail around the peak was covered with snow. From Mt. Ushigatake, there is no trail to the confluence, we had to walk all the way in bushes. We categorized those bushes in four classes--easy bush, hard bush, harder bush, and hardest bush. Easy bush is a bamboo grass bush up to our knees or waist. 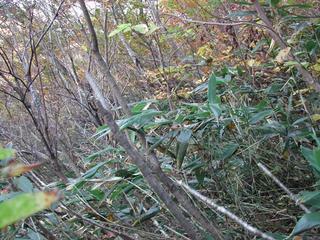 Hard bush is a bamboo grass bush up to our height or more, in there we canﾕt see forward. Harder one is a hard bush + trees in it, we have to walk avoiding trees. Hardest bush is a mix of bamboo grasses, trees and vines, in there we have to straggle with all our power and technique to go forward. From Mt. Ushigatake, we walked on the ridge, mostly in easy bush, sometimes in hard bush. Weather was very fine, and we could see the confluence far from south. We decided to stay at a col, 1450m heights. We put our tents on bamboo grasses, got into it to hold them down. 17-Oct-2004 We climbed Mt. Mitsuishi, then go down a ridge toward NNW. The ridge became narrower and bush became higher and crowded. We walked in the hardest bushes, and could proceed 500 meters per hour, or less. We started at 6:45 and got the plain peak (which is just 290 meters away from the confluence) around 2 p.m.
That place was so nice for camping! It was plain and there is no bush. We decided our second campsite at there. From there, we started our final approach to the confluence. We walked down and tried to find the place. It took 2 hours to get to the point, 290 meters away. At 4 p.m. we were at the confluence!! Moving back from the confluence to our campsite, we celebrated our success with a tin of beer. 18-Oct-2004 As our primary plan, we would go back on the same route we had traced. But we felt that it would be very long, so hard, and we were tired. We changed our plan to go down from mountains for north. Going down from the plain peak, the ridge became narrow and steep. We walked down slowly according to the direction, our compass indicates. Sometimes we had to walk on a rock ridge, both sides of the ridge were beautiful rock slabs going down for hundreds meters. After walking in bushes for 5 hours, we got to the rain observation facility, from there we could walk on a good trail down to Nonaka. At Nonaka we called for taxi to pick us up to our starting point. Our 3 days visit had ended. Each member of the team felt the same, "I enjoyed the visit very much. But, I never want to do it again". We advice to the next visitor to N 37 E 139 that: It is easier to visit there from north. It may be possible in 2 days, but you should be good at bush walking and navigation. Good luck and have fun.